Leaves of three? Seek them out. Anyone who has lived near poison oak or poison ivy (which probably means almost anyone in the North America) has grown up with that rhyme. 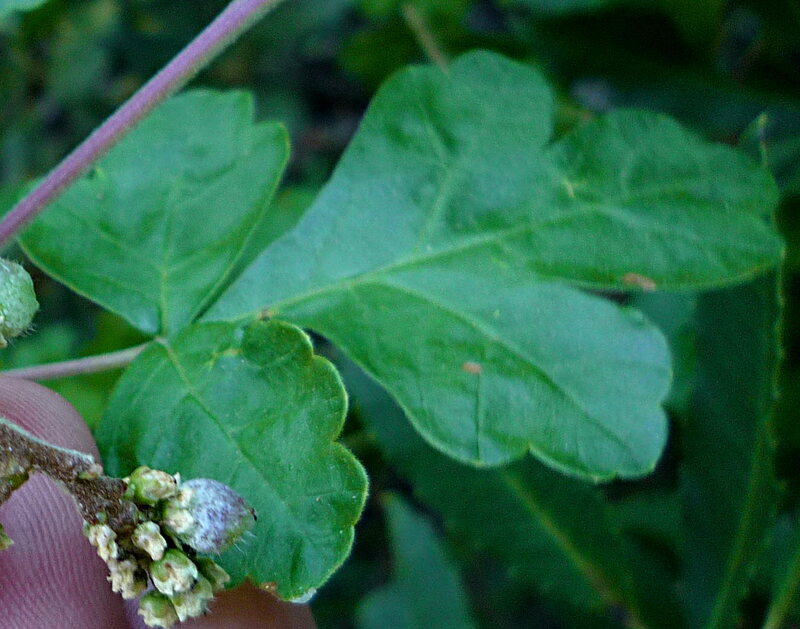 Of course once you start doing much hiking you realize there are many plants with “Leaves of three” which aren’t Poison Oak or Ivy. 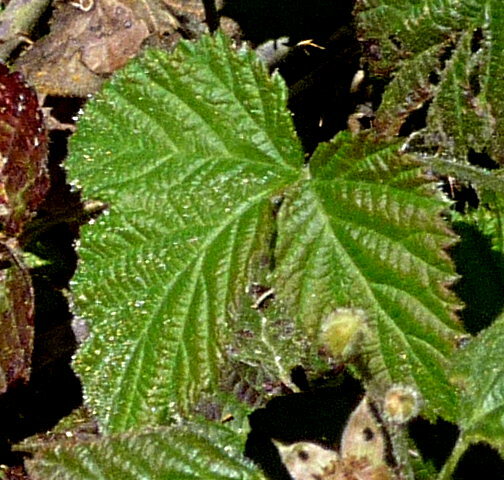 Brambles are probably the most common. And while brushing against a bramble vine isn’t really a problem, anyone who has hiked through a bramble thicket will agree that they should also be left alone. Quite a number of other species in the rose family have leaves of three, some of which are relatively harmless to blunder through. There is also a genus named “Leaves of three”, or Trifolium in latin. But the clovers are quite innocuous. 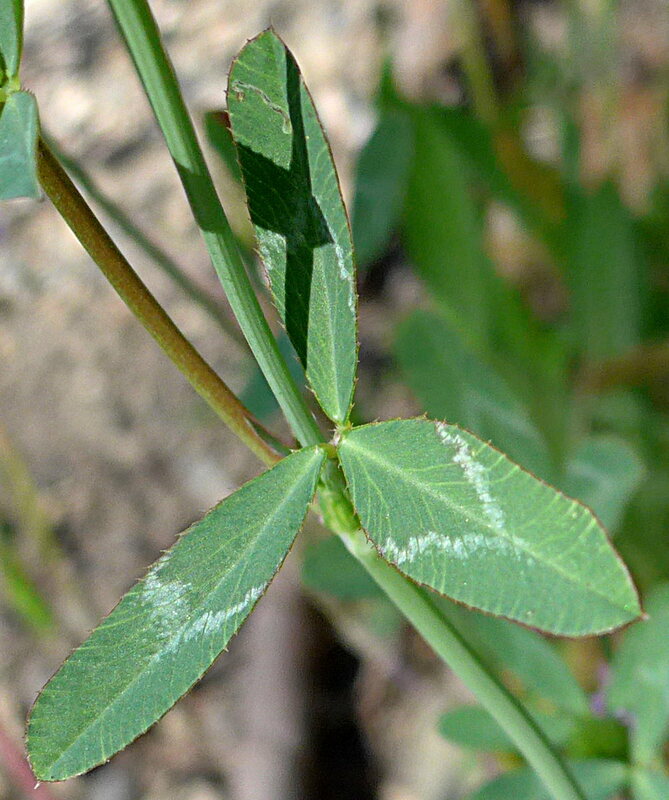 Various other legumes also have a trifoil leaf pattern, but none causes dermatitis. A friend of mine does landscape restoration and is working on a project at City College. 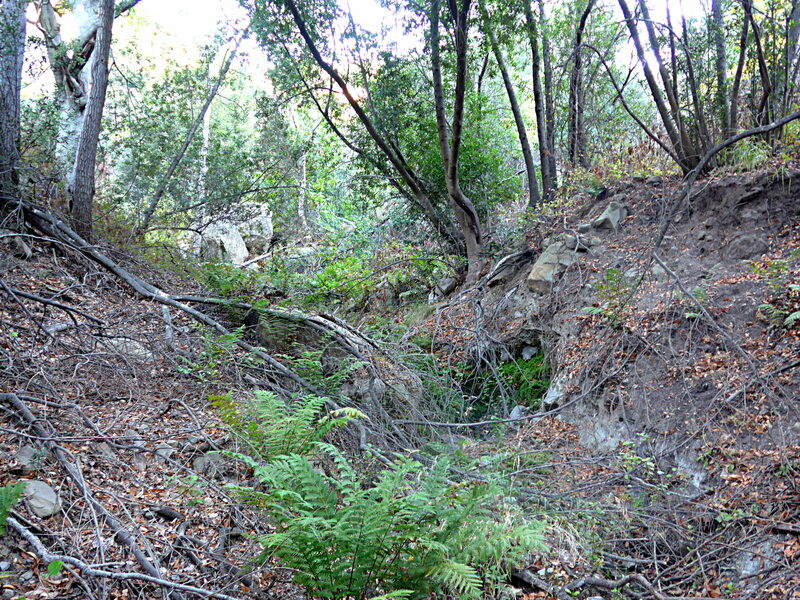 They have been tasked by the local basket-weavers to provide an area for growing the textile plants used by the Chumash. Many of these are rushes, most of which are easy to find. But one is a sumac. This plant seems to have been eradicated from the front country, and my friend didn’t know where to find it. But it is actually fairly common in the back country. I made a little map of where I’d seen it (click on the map to make it legible), and then offered to get her some twigs to root when I next went into the back country. 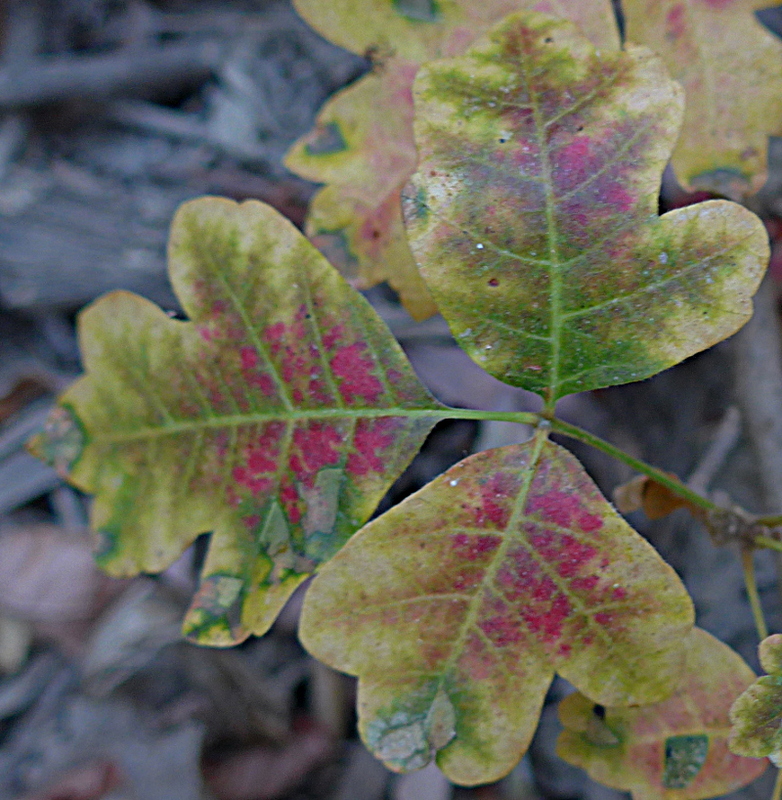 Now when I was a child, poison oak was placed in the sumac genus. And this particular sumac is called Rhus trilobata, or three-leaved sumac. In other words it looks almost exactly like poison oak. It’s leaves are a bit smaller, but that’s about it. If the flowers were blooming they’d be easy to distinguish, but they aren’t blooming now. In fact the best time for rooting these plants is when they are dormant — when all the leaves have dropped off in the autumn. Which makes them a bit tricky to identify. One stick looking very like another. Luckily I know exactly where some patches are. Now I’m not supposed to go harvesting from the National Forest, but this patch was encroaching on the trail so I was actually doing trail maintenance. When I got to my patch I saw that this fiction was well founded as there where signs that it had been hacked back in the past. I took out my snips a collected 8 springs, each about as thick around as a pencil. When I finally got home I placed them in water. 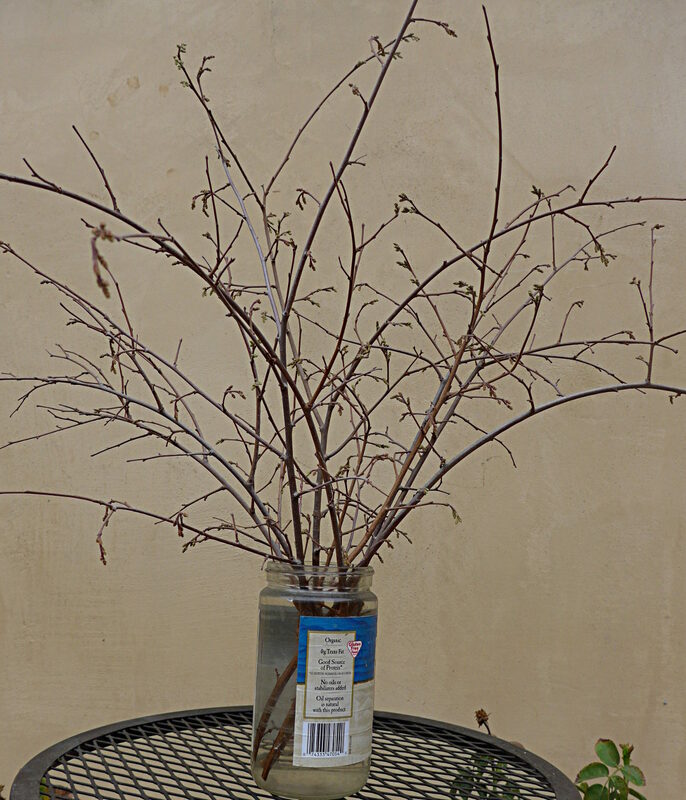 A bouquet of dormant twigs. I had always assumed (without thinking much about it) that when a food package claimed its contents represented 100 Calories then that figure would be basically correct. In other words, if you took the food and dessicated it and burned it, it would give off 100 Calories. I’d also assumed (even though if I’d thought about it I’d have known this to be wrong) that the amount of energy in the food would be closely correlated to the amount of energy the body could absorb from the food. Both assumptions turn out to be incorrect. The first assumption is incorrect because the second one is incorrect. Foods are labeled using a process called the Atwater System which attempts to adjust the actual Calorie content of food by a factor related to how well the body absorbs energy from that food. Note that in this essay I focus on the ability of various foods to provide energy (that is Calories, or at the lowest level ATP molecules), not on food’s structural (or other properties). I am interested in how best to refuel during a race — which means about all that matters is energy. This is not about recovery and only slightly about pre-race preparation. Let’s start by looking at the monosaccharide, glucose. Eukaryot cells can directly catabolize it. Each glucose molecule goes through a series of reactions in which it is broken down into CO2 and water, in the process it releases (in optimal conditions) 38 ATP molecules. ATP molecules are then used to power reactions within the cell which require energy. In actual practice only about 28-30 ATP molecules are produced (conditions inside the cell are rarely optimal). Now the energy released in ATP⇒ADP + P reaction is: 7.3kcal/mole. So, since the heat of combustion of a mole of glucose is 686Cal, then the body captures about 29*7.3/686 = 30.8% of this total energy. The rest is released as heat. When not exercising glucose can be stored in muscles as glycogen and it takes 1 ATP molecule to add a glucose molecule to a glycogen one (Glycogenesis). The reverse reaction (Glycogenolysis) does not produce any ATP so storing glucose as glycogen represents a 3~4% energy loss. (But this loss will be irrelevant to someone exercising as it will not happen then). Now let’s look at fructose, another monosaccharide, but not one that most cells of the human body can directly catabolize. Instead the liver snags fructose molecules and converts about half of them to glucose at a cost of 2 ATP molecules per fructose molecule. Some of the rest of the fructose is catabolized directly by the liver a process approximately as efficient as glucose catabolism. So efficiency of fructose catabolism is dependent on where the fructose gets used, but, averaging over both pathways, a molecule of fructose produces one fewer molecule of ATP than glucose does, and much of the energy will not reach the muscles at all. A sucrose molecule consists of a glucose and a fructose molecule bound together. Joining the two involves releasing a molecule of water, so sucrose is slightly more energy dense than its components. In the gut sucrose is broken down into its two components, and their energy is then released as if they had been swallowed whole. Not all carbohydrates are digestible (cellulose is not), but they will still burn at about 4Cal/gram in calorimeter, so all those Calories will be completely wasted to the body. Now fats (and oils and such like) consist of three fatty acid molecules bound together by a glycerol. They are broken down in the gut. Some can diffuse directly into the blood stream from there, while others go through a more complicated process. Fatty acids are not very soluble in water, but there is a protein in the blood (albumin) which binds to them, thus increasing the blood’s ability to transport them. Like glucose fatty acids can be used directly by the muscles. However because they are not very water soluble transporting them around the body and especially the cell takes longer than similar transport for glucose — which is why carbohydrates make a better fuel supply when energy is needed quickly. Moving a fatty acid into the mitocondria appears to be the rate limiting step for their catabolism. A fatty acid consists of a COOH head (methyl, the acid) attached to a variable length carbon/hydrogen chain (the fat). In nature most chains are between 6 and 22 carbons long. Chains longer than 22 carbons are not catabolized efficiently. In saturated fats there are two hydrogens for each internal carbon, in unsaturated fats there is at least one C=C double bond. The energy in the molecule comes from the breakdown of the long chain. Every two atoms of saturated carbon on the chain yield theoretically 17, but in practice 14 molecules of ATP. For a fatty acid with 2n carbon atoms the total yield is about 14n-6 (as it requires some ATP to prepare the acid in the first place, and the final two carbons must be treated slightly differently). CH3(CH2)20COOH 11 148 ??? 341 .434 ??? Most (but not all) fatty acids in nature have an even number of carbon atoms in their chains. Odd numbers can be dealt in some animals, but no one is sure how (if) that works in humans. Unsaturated fats produce slightly less energy than saturated fats, the amount depending on whether the double bond is in an even or odd position in the chain and whether it is in a cis (more common in nature) or a trans (usually man-made) configuration — trans fats being more easily dealt with. So, from the point of view of energy, saturated fats are better, and trans unsaturated fats are better than cis unsaturated fats. Rather the opposite of what we expect from a general health perspective. Fat cannot easily be converted to glucose and so can’t be used to build glycogen stores. Proteins are broken into amino acids in the gut, and then processed further in the liver. But there are 20 amino acids that can be coded for to produce proteins and they have different properties. Most, but not all, can be decomposed to produce glucose, the others can be decomposed to make ketones which can be used in fatty acid catabolism, while some can go down either pathway. When catabolizing carbohydrates and fats the waste products were just CO2 and water, which are easily disposed of. Amino acids contain all kinds of junk. All of them contain nitrogen which must be converted to urea. But converting nitrogen to urea costs ATP, about 4 of them per nitrogen atom. Serine is a simple case: serine dehydratase converts serine to pyruvate and ammonia — without needing energy (ATP) input. Now pyruvate is an intermediate in the catabolism of glucose (in other words the cell can digest it). Two pyruvate molecules can be converted back to glucose (to be shipped out of the liver) at a cost of 4 ATP+2 GTP ≅ 6 ATP (Gluconeogenesis) or a pyruvate molecule can proceed down the Krebs cycle and eventually produce ~12 ATP, but that energy is stuck in the liver. So if we want energy that can reach the muscles then two molecules of serine produce one molecule of glucose (at a cost of 6 ATP) and 2 molecules of urea (at a cost of 8 ATP) while glucose produces ~29ATP. So one serine molecule will produce ~(29-6-8)/2 = ~7.5 ATPs. Alanine is another amino acid which can be converted to pyruvate. Most amino acids can be converted to glucose and so can be used to build glycogen stores — albeit inefficiently. Unfortunately I have been unable to follow the metabolic pathways for other amino acids, so I don’t have a good handle of general protein catabolism. Energy that is not directly used is lost as heat. While serine is about half as useful as either. Energy that is not directly used is lost as heat. Which means that using an inefficient fuel supply like protein will cause the body to heat up faster, which is generally not good. Caveat: These results are the best I can do; I hope I have interpreted things accurately, but I am not a biochemist or a nutritionist. Every now and then I get the urge to follow one of our local creeks. I do this out of curiosity, I want to see where the creek goes, and what grows in it, and I do it out of stupidity as the creek bed is a pretty unpleasant place in which to travel. 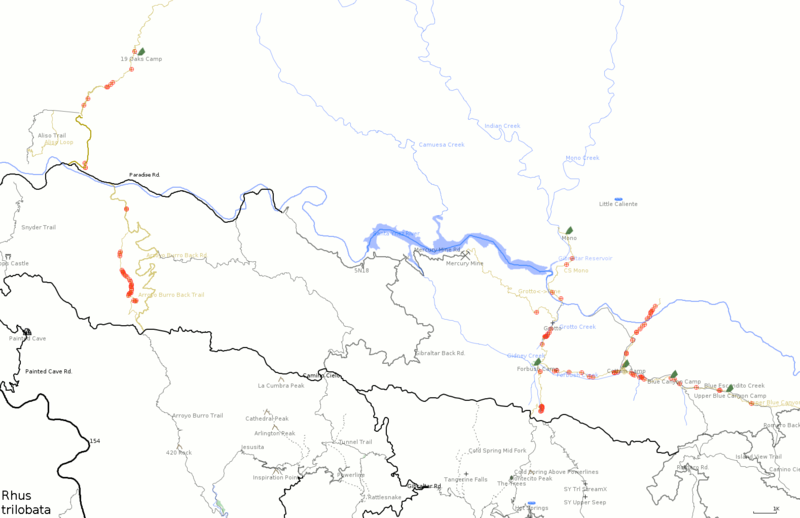 I generally pick the end of the dry season in an attempt to limit at least one unpleasant aspect of creek travel. Today I followed the creek that runs along Jesusita trail. This is called San Roque creek down near Steven’s Park, but where the trail comes out on the road (near the little bridge) there is a junction and one tributary goes up to the left, along the road, and the other goes up to the right along the trail. I followed this latter tributary. I don’t know its real name. I followed it downhill, starting at the base of the switchbacks on the trail. 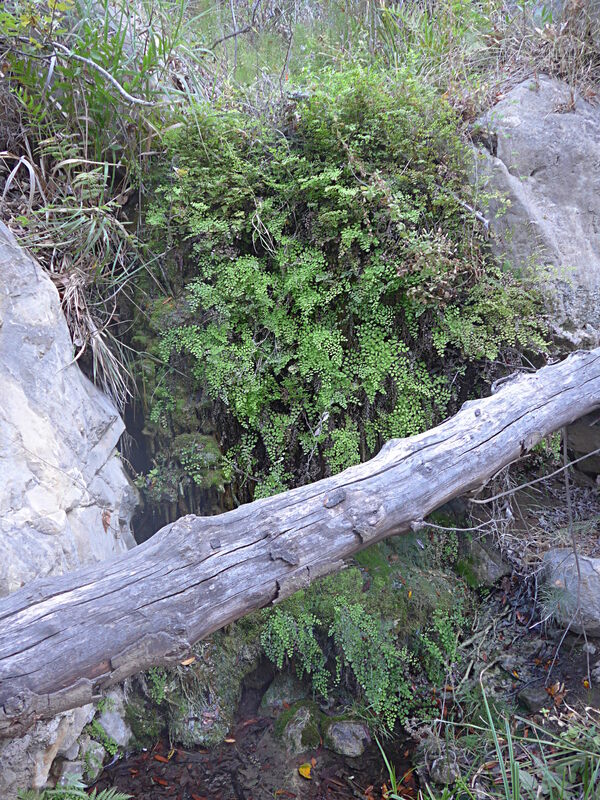 I went tromping off into the woods and then climbed down the steep bank of the canyon to reach the stream. Rather to my surprise it actually had running water. I haven’t seen running water in San Roque creek for months, but this high up there is some, and it keeps going for about a sixth of a mile. There’s a nice little waterfall here, I suppose it really is a waterdrip, but there is certainly water flowing. 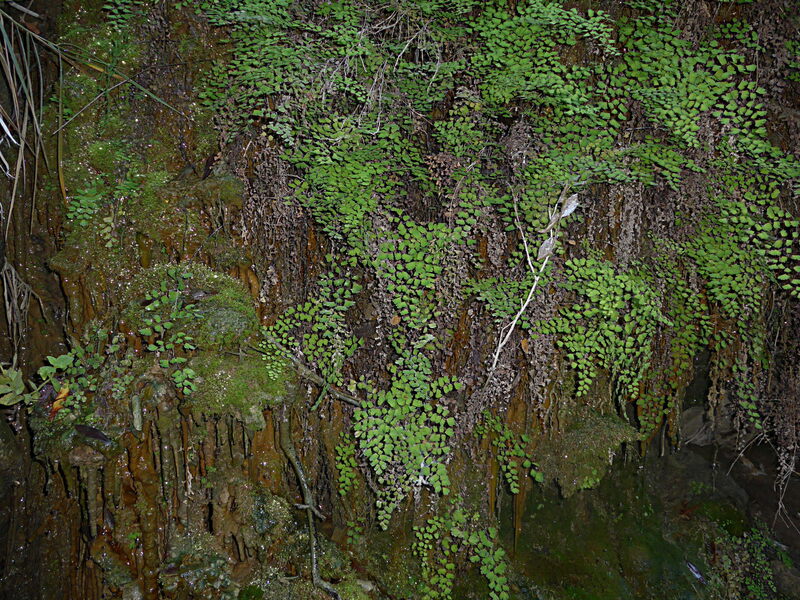 It is covered with venushair fern (Adiantum capillus-veneris) which means there must be water here year round. 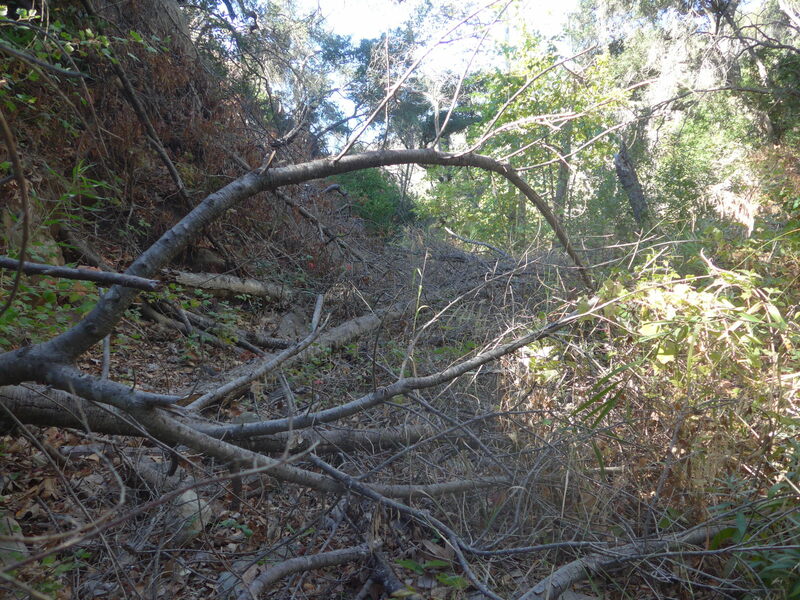 The canyon is covered with lots of sticks, and as I move further down, lots of dead trees. I guess the stream is the lowest place in the area, and any nearby trees that might have been killed in the fire 5 years ago will fall and roll down into it. These deadfalls make progress very slow. It takes me an hour to go half a mile. 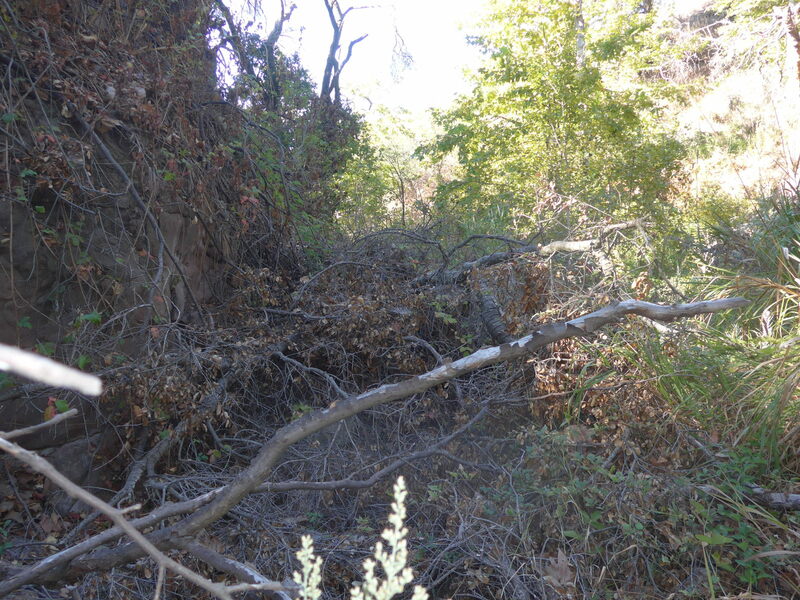 Further down there are bramble thickets, and poison oak.